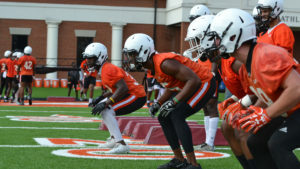 BUIES CREEK, N.C. – Campbell’s annual football Spring Game is slated for this Saturday, April 13 at Barker-Lane Stadium. The Camels will take the field at 3 p.m. following CU’s home women’s lacrosse matchup with Gardner-Webb. Campbell hosted junior days. One was held on April 6th. Another will be held coinciding with the spring game on April 13. Junior day festivities begin at 1 p.m. this Saturday, followed by team practice at 3 p.m.
To attend either the April 13 junior day, please submit the RSVP form at GoCamels.com. Campbell has two practice dates remaining for the 2019 spring period, scheduled for today (Tuesday, April 9) and Thursday, April 11th at 4 p.m. The program will also host the 11th annual Earl Smith Golf Tournament at Keith Hills Golf Club on Friday, April 12. For more information and to register, please call director of football operations Kady Knight at (910) 893-1974.